Every project is a new adventure! What moves us is the excitement towards the voids to be filled. From the necessities others require to be covered, the places that it seems no one has been before, through the multiple lacks we find in our discipline, the gap we try to jump and the space we need to develop our emotions; it seems that what puts us in motion is not what fulfils us but what unveils an empty space in front of our eyes. Sometimes we come across the concept responding to a given context (as the Public Housing we have just finished in Madrid). Sometimes we incubate the project in a laboratory and look desperately for the proper place to implement it (as the libraries we have design for Barcelona, the Canary Islands and the Helsinki Central Library). Sometimes the point of departure is not even ours (as in the Play-time Apartments). Of course, we don’t work in the outer space. Acrobatics are exciting but not a way of sustainment. Every sketch unveils genealogy lines, enrolls and dismiss actors, opens and closes narratives and summons memories and attachments. Some things become explicit, while others run unconsciously. We simply try to clean our mind out of prejudices or preconceived thoughts and put all our resources to best sustain the initiative to be constructed. Or to sum up, always keep the feet on the ground and the mind pointing the sky. Independently of who we serve in a more and more democratic and participatory world, we would like to see how our profession finds the place in it that accommodates our common will to serve others and construct a better place, to implement our passion and expertise and our capacity to work in intricate contexts and ensemble things. And we would like to get rid out of fetishes, trends and mantras and our guilty-complex along the way. For the future, we imagine an architect more aware and connected, more open and daring, and, likely, more necessary. We indeed live relativist times. For some time now, we have witnessed the rise and fall of a lot of multiple platforms of thought, both in politics, philosophy and architecture. Apparently no system of ideas or methodology can be considered as a “stable ground”. As humanists, we have become perpetual nomads. As architects, instead, we like to think that the absence of a “solid ground” on which to settle has made explicit that only the constant endeavor to consolidate, modify and construct on a given territory can provide a stable condition to it. In other words, for the human “construct”, whatever that is, it is the construction that paradoxically sustains its foundation and not the other way around! Consequently, it does not seem so relevant to us to bet on a specific idea on which to “construct” as to understand and promote the processes of “construction” per se that are able to sustain it. To do this, we always like to claim a term borrowed from the social sciences of the 60’s, Socioconstructivism. The term socio is not merely “social”, in its old-fashion meaning. It refers to the bonds and networks of “associations” that any innovation must activate and trigger ex-novo as the only way to endure. These processes, such as live, communicate and reproduce architecture, as well as an undetermined number of actions made by a myriad of agents, create the sphere outside of which our products would not survive a moment. The term constructivism, in turn, points out the artificial nature of the process of establishing associations, an artificiality that we don’t reject as designers/constructors, but embrace as a condition sine qua non to produce sustainable initiatives in the broadest sense of the word. Thus, we can imagine architects becoming in the next decades less solitary heroic builders and more “socio-constructors” of ideas. By doing so, we think we can keep some of our proverbial audacity and vindicate our expertise while holding hands intensively with the rest of the world. 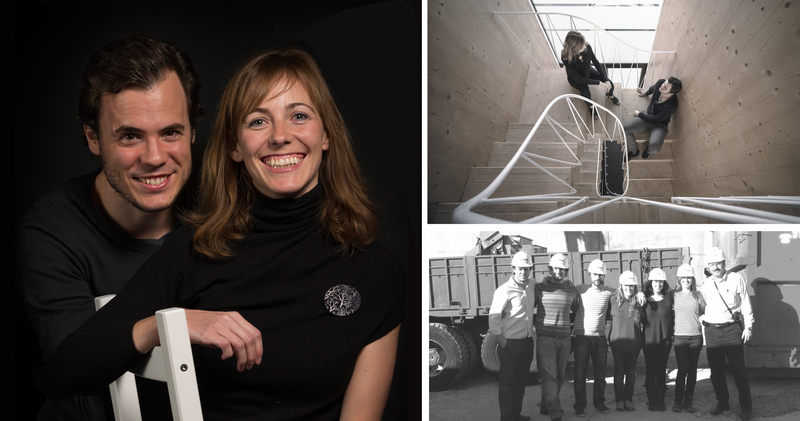 We are Elena Orte and Guillermo Sevillano, both architects graduated at the Polytechnic University of Madrid (ETSAM) and Ms in Advanced Architectural Design. Since 2005 we work together when we founded the office called SUMA, established in Madrid, Spain. Together with our team and collaborators, we have won several national and international competitions that include a Library and Nursery School in Barcelona, a Library and Multipurpose Center in Fuerteventura (Canary Islands), 50 Public Housing for the Municipality of Madrid, 73 Public Housing in San Sebastian de los Reyes for the Government of Madrid. Our work has also been selected in other competitions as the Central Library of Helsinki or the Arts Center of Verin. Our projects have been published in architectural magazines as Arquitectura Viva, Pasajes, BIA,… and architectural websites as Plataforma de Arquitectura or Afasia, etc. We have participated in different exhibitions (Feria de Madrid IFEMA, Matadero, EMVS, Fresh Madrid…) and given conferences around the world (New York, Beijing, Austria, Madrid,…). We try to keep a foot on the field of pure practice and a foot in the academic realm. Guillermo Sevillano is an Associated Professor at the Polytechnic University of Madrid (ETSAM) and he has been teaching at Camilo Jose Cela University. He studied the MS in Advanced Architectural Design, GSAPP in Columbia University and is currently developing his PhD thesis at the ETSAM. Elena Orte has been Assistant Professor at the Polytechnic University of Madrid (ETSAM) and has studied the MS in Advanced Architectural Design in ETSAM. They have both participated in national and international seminars and workshops around the globe (Sao Paulo, New York, Madrid, etc. ).